(NaturalNews) Even if farmers stopped using nitrogen fertilizers today, dangerous nitrate levels in drinking water would persist for decades, report researchers at the University of Waterloo. Nitrogen fertilizers are used to prevent nitrogen from becoming depleted from the soil. 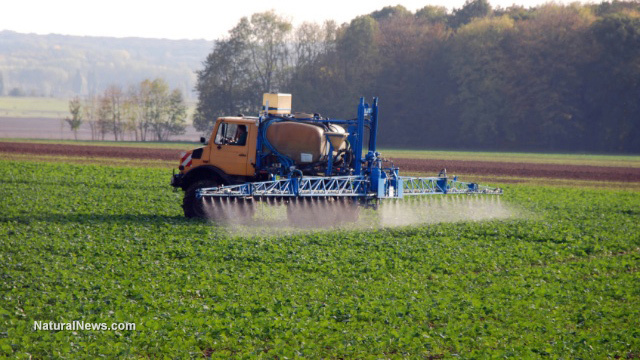 Unfortunately, the overuse of nitrogen fertilizers isn't without its long-term consequences. According to a new study published in the journal Environmental Research Letters, nitrogen fertilizers are causing nitrates to build up in the Mississippi Basin, polluting ground and surface water. Nitrates increase the risk of blue baby syndrome, according to the recent study. The illness replaces a child's hemoglobin with methemoglobin, which minimizes the ability of blood to carry oxygen throughout the body. Infants are most often affected by the malady, which is marked by a blueness around the mouth. Other symptoms include difficulties breathing, vomiting and diarrhea. In extreme cases, blue baby syndrome can be fatal. Methemoglobinemia is often spurred by malnutrition and infection. The likelihood of symptoms unfolding is contingent upon a myriad of factors, including the infant's general health and daily vitamin C intake. However, the most common cause of methemoglobinemia is high levels of nitrates in the drinking water. "A large portion of the nitrogen applied as fertilizer has remained unaccounted for over the last decades," Nandita Basu, a professor at the Department of Earth and Environmental Sciences and Civil and Environmental Engineering, said in a press release. "The fact that nitrogen is being stored in the soil means it can still be a source of elevated nitrate levels long after fertilizers are no longer being applied." The study was the first to provide direct evidence of a large-scale nitrogen problem across the Mississippi River Basin. Nitrate levels are relatively low a few centimeters beneath the Mississippi Basin, however levels begin to spike 25 to 100 centimeters down. The spike in nitrates isn't a consequence of rainfall, but has been accumulating under the soil for decades. The Canadian researchers estimate that it will take 30 years for nitrate levels to return to normal – and that's assuming farmers quit using nitrogen fertilizers today. The team unearthed the toxic buildup of nitrogen after reviewing long-term data of more than 2,000 soil samples. The highest levels of nitrogen were consistently found in deep soil samples rather than in shallow samples. "We hypothesize that this accumulation occurred not only because of the increased use of fertilizers, but also increases in soybean cultivation and changes in tillage practices over the past 80 years," said Kim Van Meter, a PhD student in the Department of Earth and Environmental Sciences, who was involved in the study. Nitrogen is intended to restrict nutrients for plants and boost crop yields. When applied in excessive quantities, however, nitrogen can stir hazardous hypoxic conditions on par with the Gulf of Mexico's massive dead zone. Hypoxia occurs when there is an insufficient supply of oxygen to sustain life. The hypoxic zone in the northern Gulf of Mexico is the largest hypoxic zone in the United States, and the second largest in the world. The accumulation of nitrates in the Mississippi Basin will without a doubt bring about lawsuits. In fact, some lawsuits have already been filed. The Des Moines Water Works recently filed a lawsuit against three northwest Iowa counties over water quality, demanding that the counties meet federal standards for nitrates in public drinking water – a demand that would cost the counties millions of dollars. Debate rages about who is to blame for the spike in nitrate levels. Some argue that farmers who used too much nitrogen fertilizers are at fault, while others argue that insufficient drainage systems are to blame. Although policy makers and farmers have taken great strides in minimizing the amount of fertilizer contaminating the ground water, some rural areas have nitrate levels twice the amount permitted by the drinking water standards, according to sources. "The presence of this legacy nitrogen means it will take even longer for best management practices to have a measurable benefit," Professor Basu, also a member of the Water Institute, said in the press release. "If we're going to set policy goals, it's critical we quantify nitrogen legacies and time lags in human impacted landscapes."